That’s the key lesson from a recent federal appeals court ruling that a health-care worker may have “implied” her need for more time to recover from neck surgery before being required to obtain a job-related skills certification, a pair of lawyers who represent employers and a human resources training consultant told Bloomberg BNA in recent interviews. It’s the fault of human resources, for failing to train managers well enough, she said. Fleischer is the president of HR Learning Center in Rye, N.Y., a company she founded in 2003. An attorney, Fleischer’s 25 years of experience in the field also include a stint with management-side firm Epstein Becker & Green P.C. Managers should be educated that there can be questions surrounding the issue of whether and when a job accommodation has been sought under the ADA, Bill Egan of Fox Rothschild LLP in Minneapolis said. Managers need to get human resources involved when they’re thinking about disciplining or firing a poor-performing employee, he said. “It’s good practice” to make sure HR has all the relevant facts, so managers need to be trained to alert HR about any disability the manager knows the worker may be struggling with, Egan added. Training managers “is a big task” for employers trying to comply with the ADA’s reasonable accommodation and other provisions, Katrin U. Schatz of Jackson Lewis P.C. in Dallas said. The broad view some courts have taken on when an accommodation request has been made “means employers must place the burden on managers” to have a better understanding of these situations, she said. That understanding also includes an awareness of the restrictions the ADA and the Equal Employment Opportunity Commission place on employer medical inquiries of employees, she added. Managers need to be trained to understand “how much to ask and how much not to ask,” Schatz told Bloomberg BNA. When Is ADA’s Interactive Process Triggered? An employee request for some sort of assistance with or adjustment to her duties so she can continue in her job—what the ADA refers to as a job accommodation—triggers an employer’s obligation to engage the worker in an interactive dialogue to try to find a reasonable solution, Egan said. The statute puts the onus on the employee to request an accommodation, which typically takes the form of the worker telling the employer she has a medical issue and needs some help doing her job, such as temporary relief from specific duties. The employee doesn’t have to use the word “accommodation” to trigger the interactive process, but she must in some way communicate to the employer her desire for assistance unless her need for an accommodation is “obvious,” Schatz said. A question sometimes arises over whether the need for an accommodation was or should have been obvious to an employer, Schatz said. That was the issue before the U.S. Court of Appeals for the Eighth Circuit in Kowitz v. Trinity Health, No. 15-1584, 2016 BL 344385, 33 AD Cases 1 (8th Cir. Oct. 17, 2016), she said. In the case, a 2-1 court found that Trinity Health’s knowledge of Roberta Kowitz’s prior neck surgery may have helped to put the employer on notice of her need for further accommodation when she informed her supervisor that she had to undergo four more months of physical therapy before she could complete the physical portion of a required CPR recertification process. The court noted, among other things, that Kowitz was still being accommodated at the time of that communication, in the form of the suspension of lifting and other job requirements. The company was also “aware of Kowitz’s specific condition, as well as the general nature of the limitations it placed on her,” the Eighth Circuit found. The decision takes the traditional rule that “magic words” aren’t needed to trigger the ADA’s interactive process “further than it generally” has been taken before, Egan said. The Eighth Circuit majority found that Kowitz either implied, or Trinity should have inferred, that she needed an accommodation, he said. Schatz said she thinks the result in Kowitz was “really fact-driven,” especially given that the employee’s medical condition appeared to be temporary and that she ultimately would have been able to resume her full duties. “Other cases have much more heavily placed the burden on employees” to make clear that they need help, Schatz said. She cited as an example the U.S. Court of Appeals for the Tenth Circuit’s 2013 decision in Koessel v. Sublette County Sheriff’s Department, 717 F. 3d 736, 27 AD Cases 1569 (10th Cir., 2013). It’s unclear whether courts are trending in a particular direction on the issue of when an accommodation request may be deemed obvious from the circumstances, or whether there’s a bottom-line that can be drawn from the cases, Schatz and Egan both said. The lack of uniformity in the case law “leaves employers wondering what they need to do,” Schatz said. As a result, “employers are well-advised to take a more proactive approach” in these situations, because it’s not clear which way a particular court might lean if an employee brings a claim, she said. That’s why training is so important. It’s necessary that HR personnel “be fully apprised” of Kowitz and similar decisions, Egan said. Schatz said managers must be trained to understand how to recognize when a request for accommodation is being made or may be implied from the circumstances. If managers aren’t trained well enough to spot potential issues, they may not be brought to the attention of a human resources representative until it’s too late, she said. Fleischer shares that concern. She said many employers fail to provide managers with any training on the ADA accommodation process, let alone the nuances of when a request has been made or may be implied from the circumstances. Managers are “flying blind,” she said. HR knows the ins-and-outs of the ADA, but it’s managers who are on the front line with workers and thus in a position to hear or notice when an accommodation may be needed, Fleischer said. Employers should train managers on the basics of the ADA, so a “red flag” will go off in a manager’s mind and they will “run, not walk” to HR if they encounter a situation where they think an employee may require an accommodation, Fleischer said. Explaining when a potential need for accommodation may be obvious or implied is part of the training her company provides to employers, she said. HR Learning Center provides ADA training to an employer’s HR personnel, but will also train managers when asked to do so, she said. “There’s isn’t a training I do for HR where I don’t say, ‘you need to train your managers,’ ” Fleischer told Bloomberg BNA. She said her company provides multi-faceted training that lays out case scenarios for trainees and how the law applies in each specific case. It also includes interactive games to reinforce the training, so trainees “can apply the concepts they learn to different factual scenarios,” Fleischer said. Does Data Support Need for Training? The data show that ADA claims, especially those alleging a failure to accommodate, may be a growing concern for employers. There were 1,635 ADA job bias lawsuits filed in or removed to federal court in 2010. That number has increased each year since, other than in 2013 when they dipped before rising again the following year. 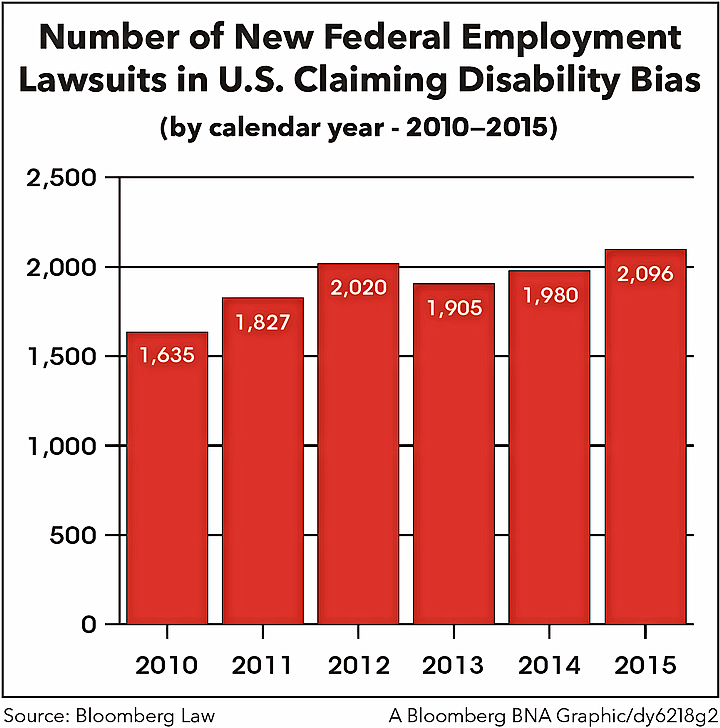 In 2015, federal court ADA job bias filings reached 2,096. 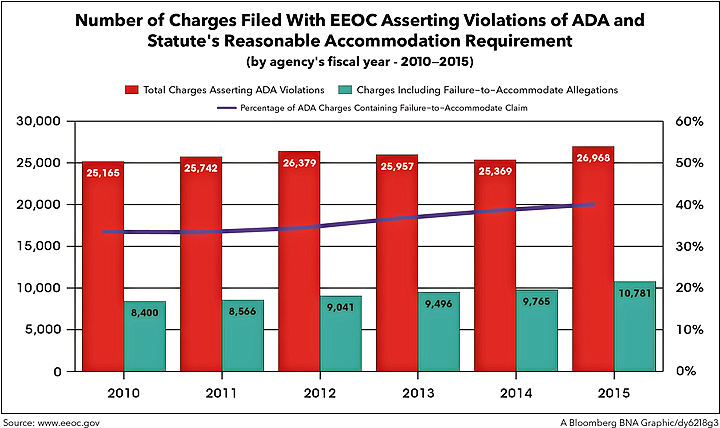 EEOC charge statistics for the agency’s 2010-2015 fiscal years show a similar rise—25,165 charges filed in FY 2010 that included disability bias allegations versus 26,968 such charges in FY 2015, with a slight dip in 2012 and 2013. Over the same span, the percentage of ADA charges containing failure-to-accommodate allegations has steadily risen from 33 percent to 40 percent. “An employer who engages in the interactive process is 80 percent of the way there,” Egan said, agreeing that a proactive approach is best. The EEOC expects employers to fully engage with disabled or medically impaired workers in an attempt to find a suitable job accommodation, he said. “If you don’t engage in the interactive process at all,” or if the process is summarily cut short because the accommodation requested by the employee is considered to be unreasonable, “you’re gonna get scrutiny from the EEOC,” Egan said. But an employer’s obligation is simply to provide an accommodation that is reasonable under the circumstances—it doesn’t have to be the one the employee prefers, Egan added. And employers should be sure to document their accommodation discussions with employees, he said. The interactive process often involves multiple rounds of discussions and multiple proposed accommodations, Schatz noted. Managers need to partner with HR during these discussions, and an employer’s documentation of the interactive process should show that the full range of options were exhausted, she said. Egan and Schatz agreed that the interactive process often involves seeking the input of the employee’s medical provider, who may provide detail about the employee’s condition and even suggest possible accommodations. They also agreed that accommodation discussions usually are most productive when conducted face-to-face with the employee, when possible. Discussions regarding an employee’s medical situation are often “very difficult,” as the employee may be required to reveal “private, sensitive” information, Schatz said. For that reason, “you want to have those discussions done in a comfortable setting,” where the players can look each other in the eye and relate to one another, she said. With regard to the disclosure of private and sensitive personal information, Schatz cautioned that managers must be aware of—and therefore trained on—the ADA’s limits on the types of medical inquiries that may be made by employers. Most managers are nervous about seeking private medical information from a subordinate, and employers need to be sure that they’re not asking for too much information, Schatz said. Any information requested must be job-related and concern the essential job function or functions for which the worker has requested an accommodation, she said. Moreover, managers need to understand “how to ask” employees for sensitive medical information, she said. The bottom-line is that, through training, managers need to develop a “nuanced” understanding of the ADA, Schatz said.